This province, located between Tuscany, Latium and Marche, is the only region in Italy that has neither a coast nor an international border. 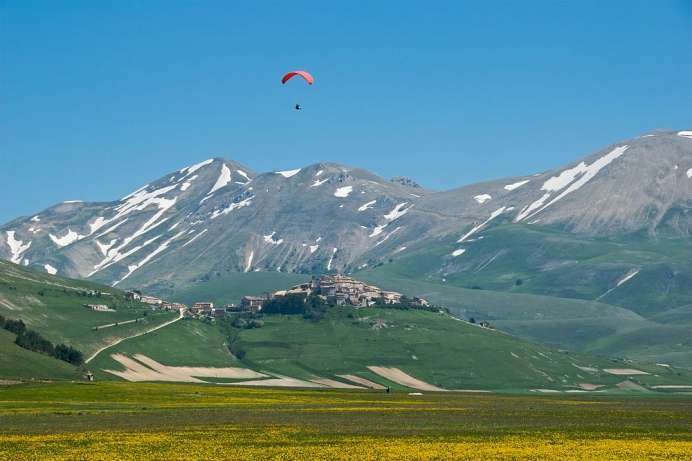 It is characterized by green rolling hills, where sheep and cattle graze, by valleys with vast corn fields, and by the alpine-like features of the Umbrian Apennines, which reach their highest point at Monte Vettore (2,478 m). The Tiber has its source here, and its headwaters are surrounded by a delightful cultural landscape. Lake Trasimeno, overshadowed by gentle mountain ridges, lies northwest of the capital city Perugia, near the Tuscan border. The earliest signs of human settlement are from the Umbri, a tribe belonging to the Italic peoples, and which migrated here in 1200 AD. They were later influenced by the Etruscans. The birthplace of Saint Francis still has a medieval townscape and is surrounded by a well preserved city wall. The basilicas of San Francesco and Santa Chiara hold the bones of the two saints. Santa Chiara was a companion of Francis and the founder of the Franciscan Order, also known as Poor Clares. Worth seeing are the hermitage Eremo delle Carceri set amongst dense forest on the slopes of Mount Subasio, and the convent of San Damiano, built on the spot where, according to legend, the crucifix had spoken to St. Francis. Today Assisi is one of the most important places of pilgrimage for Christianity. Therefore one must not expect to find the peace and solitude in which the most significant saint of the Catholic Church has spent his life in the 13th century. Italy's fourth largest lake lies in the Umbrian hills. Fishing always has been – and still is – the main income for the people of the nearby villages. Although there are many beaches and campsites along the shores and the water is very warm in summer, its quality is not of the highest standard. 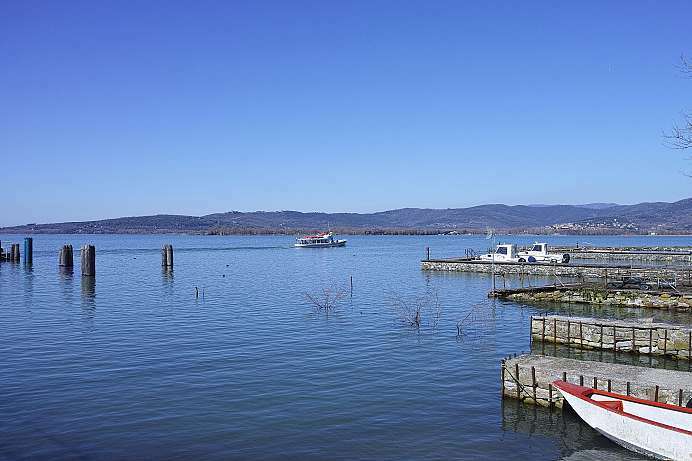 Instead one can hike or bike on beautiful trails through the gentle landscape to interesting places like Castiglione del Lago, perched above a headland. Many historic buildings lying on a circular route bear witness to the early importance of this sleepy town. In the Middle Ages the town was fortified with a wall and a castle. From the 16th century onwards pirate raids and malaria (the mosquitos carrying the disease living in the nearby swamps) contributed to its demise. Today there is a reservoir to irrigate the surrounding agricultural lands. There is a long sandy beach on the coast. Perugia, the capital of Umbria, is the most prominent city between Florence and Rome. 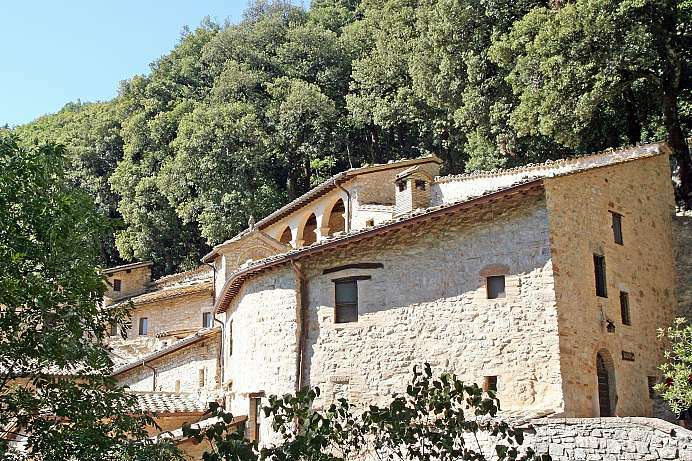 The town built on the back of a mountain has numerous architectural sites dating from the antiquity to the present. 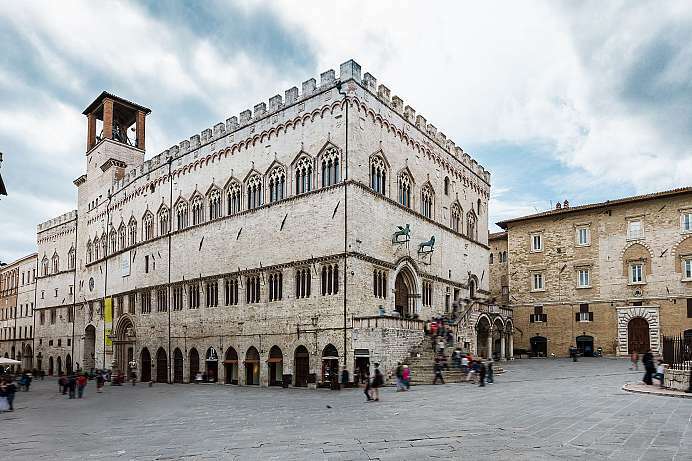 The most important of these is the Palazzo dei Priori, a massive yet finely worked structure built in the 13th century to house the local government. Life in the city becomes vibrant in a typically Italian fashion on warm summer evenings. The city owes its vitality in part to the 30,000 students drawn there by the university. The main cultural event held each year is the Umbria Jazz Festival. 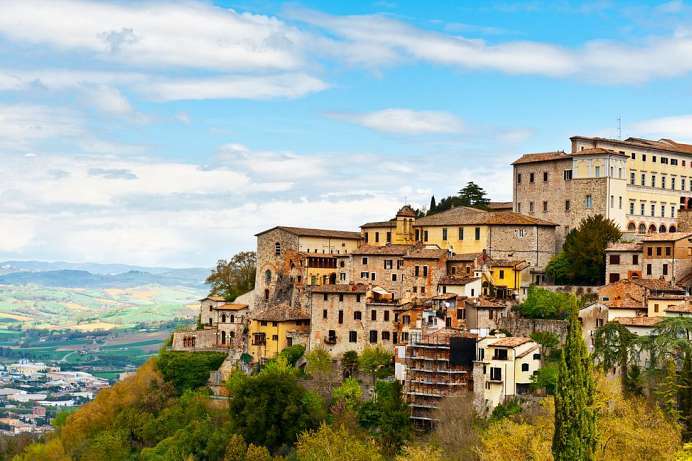 The town of Todi (population: 17,000) stands on a hill overlooking the Tiber Valley on a site that has been inhabited since the 8th century BC. 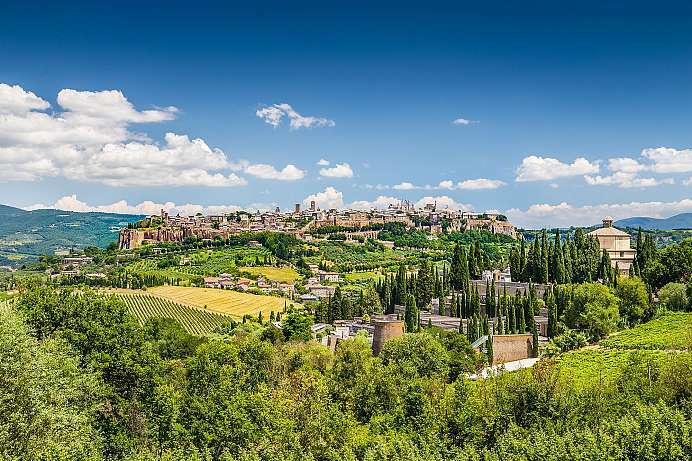 Despite its favorable location, Todi never became more than a provincial town. This was due to a series of setbacks. During the Migration Period, the town was destroyed by the Goths and taken over by the Lombards. In 1527, half of the population died of the plague. The bishopric of Todi was eventually dissolved. At the center of the old town lies the Piazza del Popolo, where the 12th century cathedral and several secular palaces stand across from each other.